Industrial Structures – SMARTT: Scale Models, Arts, & Technologies, inc.
One of the most fascinating aspects of dioramas is that they can take the viewer where it's too dangerous or costly to go. 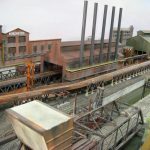 It should come as no surprise that some of the more popular subjects for dioramas are locations of an industrial nature, like machine shops, steel mills, or heavy manufacturing complexes. The talented model-makers at SMARTT have reproduced these complicated environments time and again in a number of scales to create intricate and involving miniature worlds.